“The prologue to this biography is a gripping, beautifully written opening….As well as bringing new insights to bear on the well-known details of his subject’s life…his relation to the Romantic movement and the breadth and influence of his writing, the biography also narrates intimate moments that reveal not only the chaos of De Quincey’s domestic and professional life, but the sheer banality of material hardship and drug addiction….Morrison’s erudition, his commitment over 400-plus pages to narrating with clear sight and judgement a life so complex and conflicted, and around which such a potent mythology has grown, is remarkable.” – Sue Chaplin, British Association of Romantic Studies Bulletin and Review, July 2012. “Robert Morrison’s very fine…biography of Thomas De Quincey.” – Adam Gopnik, “Tory Tabloidism: Fox News’ Opium-Eating Great-Uncle”, The New Yorker, 16 March 2012. “The English Opium-Eater will stand as the authoritative De Quincey biography for our time.” – Robert Archambeau, Essays in Criticism, October 2011. “Excellent….Morrison makes vivid the intellectual and moral versatility of his subject…Morrison explores De Quincey’s contradictions, and he explains the multiple motivations and effects of writers and publishers alike in this period of massive literary commercialization and development. A substantial contribution to studies in Romanticism and also studies in the Victorian period…Highly recommended.” – T. Hoagwood, Choice, September 2011. “An infamous figure in the canon of English literature, De Quincey’s extracurricular activities make Pete Doherty look as dangerous as Mary Poppins. His grim life and times are related in a new biography, The English Opium-Eater, by Robert Morrison. Author of 1821’s hugely influential Confessions of an English Opium-Eater, De Quincey has been held up as an antihero figure by all manner of hapless berks. The reality, as Morrison skillfully relays in this balanced account, was altogether more squalid.” – AU [Alternative Ulster] Magazine, July 2011. “Morrison’s strength is best indicated by the extent to which he is able to evade the allure of his subject’s self-projection, while never losing it as a reference point. Convinced of De Quincey’s relevance today, he conveys the sense of an indecisive yet defiant post-modern consciousness lost in a world before its time.” – Bhaswati Chakravorty, The Telegraph, Calcutta, 8 July 2011. “Robert Morrison’s astute and sympathetic literary biography The English Opium-Eater….presents a vivid portrayal of this artist….The English Opium-Eater is the outcome of brilliant insightful research. We have a masterly and engrossing account of the challenges met by Thomas De Quincey in his journey along the twisted and winding roads.” – M. S. Nagarajan, The Hindu, 3 April 2011. “Morrison’s biography describes…the exhausting productivity of a now under-read writer, and fleshes out his less than heroic life. His impressive account shows, above all, that the world from which a writer seeks to escape can be as absorbing as the one he creates for himself.” – Laura Marsh, The New Republic, 15 February 2011. “Confessions of an English Opium-Eater…Morrison suggests, offers an influential prototype for the figure of the bohemian who combines ‘drugs, intellectualism, unconventionality, and the city.’ Yet De Quincey himself, in one of several paradoxes finely mapped by Morrison, was a staunch Tory who ‘insisted defiantly on the status quo.’” – The New Yorker, 7 February, 2011. “Morrison…offers what is certainly the definitive biography of the extravagantly talented scholar, essayist, critic and political commentator who wrote Confessions of an English Opium-Eater, the first account of a literary junkie.” – H. J. Kirchhoff, Globe and Mail, 29 January 2011. 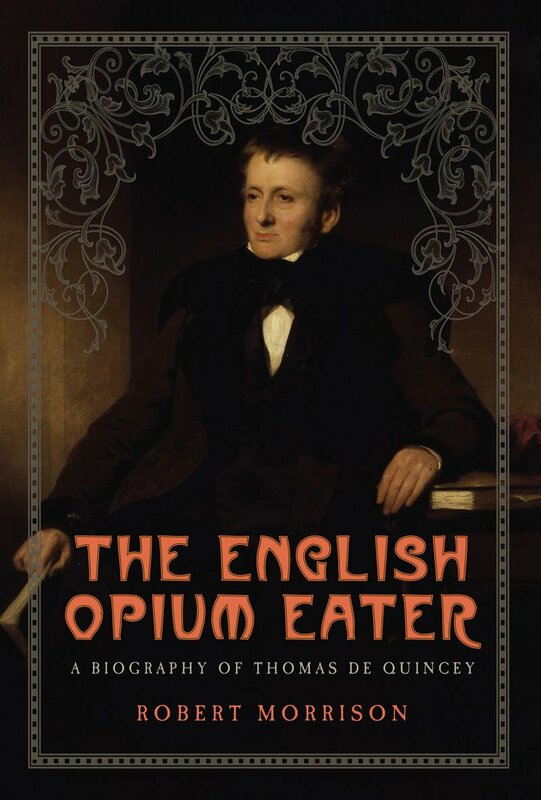 “The English Opium-Eater: A Biography of Thomas De Quincey follows the literary career of one of England’s most famous writers and tries to understand his life and how it affected his writing. It also discusses his serious opium addiction which warped his writing even more….A fascinating read that will prove very hard to put down.” – Midwest Book Review, January 2011. “In this lucid, deeply researched biography, Robert Morrison makes plain that De Quincey wasn’t just a recreational user, but truly a slave to his habit…..If you’ve never read Thomas De Quincey, you should first pick up a good selection of his writings. Afterwards, when fascinated by the man, as you will be, turn immediately to this excellent, detailed and often harrowing biography, The English Opium-Eater.” – Michael Dirda, The Washington Post, 30 December 2010. 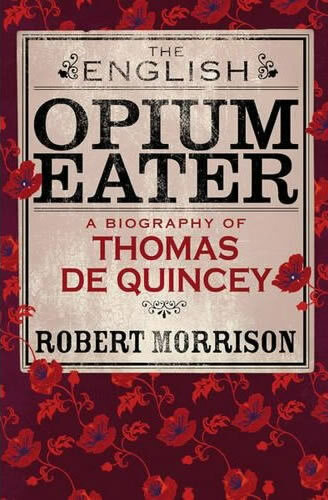 “Robert Morrison’s biography of De Quincey, The English Opium Eater…is a much-needed corrective to the trust so many people seem to place in addiction memoirs….A superb biography.” – Jessica Warner, The Globe and Mail, 18 December 2010. “In this readable, perceptive and illuminating biography, Morrison explains why the Confessions were so innovative and influential: ‘In them, he invents recreational drug-taking, not because he is the first to consume opiates or alcohol for non-medical purposes, but because he is the first to memorialise his experience in a compelling narrative that is aimed at a broad commercial audience.’” – Christopher Hirst, The Independent, 17 December 2010. “When you’re looking for the best of literary journalism, the place to go isn’t Bookslut or McSweeney’s, but Hazlitt himself, and his contemporary and rival Thomas De Quincey (1785-1859), who is the subject of Robert Morrison’s superb biography The English Opium Eater….This is the first biography of the writer in decades…and in fact I can’t imagine anybody ever needing to do the job again. Mr. Morrison gives us an admirably lucid tour through the long, chaotic shambles of De Quincey’s life.” – Lee Sandlin, The Wall Street Journal, 11 December 2010. “Drawing on new sources, Morrison has written a balanced and affectionate account of a life of unfulfilled promise. He is especially good on De Quincey’s life-changing encounter with Wordsworth and Coleridge and his role in establishing the cult of the Lake Poets (although later Wordsworth shunned De Quincey for marrying a farmer’s daughter). It is also illuminating on Ann, the prostitute who rescued De Quincey in London, then mysteriously disappeared.” – Ian Pindar, The Guardian, 20 November 2010. “Robert Morrison’s engaging biography….demonstrates that, unlike the other two great Romantic essayists, William Hazlitt and Charles Lamb, De Quincey did not write ‘familiar’ essays or even straight autobiography. He is closer to his idol Wordsworth in the ability to write about himself in a register that hovers somewhere between bare factual reporting and the realm of myth. This more than establishes his claim on the modern reader.” – Peter Schwendener, Commonweal, 19 November 2010. “If expressive intensity from the despondent to the ecstatic defines the romantic sensibility, De Quincey exemplified the zeitgeist. That he also knew everybody – Wordsworth, Coleridge, Lamb – spices up Morrison’s vivid portrait of an unprepossessing, painfully polite, but determined personality who, though he did not invent confessional self-dramatization, innovated within the form through his crisis-ridden literary life. Connoisseurs of biography in any subject area will relish Morrison’s pace and occasional puzzlement toward his subject.” Gilbert Taylor, Booklist, 15 November 2010. 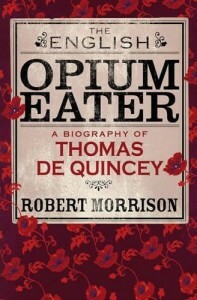 “The English Opium-Eater, Robert Morrison’s excellent new biography, should interest a new generation of readers in Thomas De Quincey and will add critical depth to the understanding of those who already have long appreciated this man who bounced between the periphery and the center of Romantic and early Victorian literary culture….The English Opium-Eater provides an engrossing popular account of a writer who aspired to rarefied scholarship and who achieved knowledge held by few others of his generation.” – Michael Wiley, The Wordsworth Circle, Autumn 2010. “It’s nicely done and gives us an excellent supplement to De Quincey’s own Confessions.” – Nicholas Bagnall, The Sunday Telegraph, “Pick of the Paperbacks,” 14 November 2010. “Aware that his subject is both destructive and talented, Morrison skilfully retains our sympathy for a man who forfeits it on almost every page.” – John Carey, The Sunday Times, “Pick of the Paperbacks,” 7 November 2010. “This is an engrossing and deeply sympathetic study of a man who suffered more than his share of miseries, more than his haul of horrors, yet who left an indelible mark on nineteenth-century literature. The book also affords fascinating insights into the life of a hack author ‘with all its horrible degradations.’” – Clive Davies, Writing Magazine, November 2010. “The English Opium Eater: A Biography of Thomas De Quincey…benefits from the magnificent De Quincey collection issued a few years ago by Pickering and Chatto, to whose achievement Morrison himself was a major contributor, editing or co-editing four of its 21 volumes. Morrison’s immersion in not only published editions but also manuscripts unpublished before this comprehensive series made them available (indeed, much of the correspondence is still unpublished) brings unrivalled authority to his biography.” – Keith Wilson, Literary Review of Canada, November 2010. “Misconceptions persist about De Quincey and his work, but Morrison’s adept narrative fills in many gaps and portrays the writer as a man struggling between the joys of writing and rigorous thought and the sorrows of addiction and debt. The author excels in his argument that De Quincey is an integral part of literary history, and above all, a ‘noble explorer of self’. A welcome, refreshing literary biography”. – Kirkus Reviews, 15 October 2010. “Morrison’s treatment is comprehensive in its even-handed presentation of unflattering details and emphasis on the tremendous impact De Quincey had on the birth of the mass market for journalism and literature in Great Britain.” – The Library Journal, 1 October 2010. “The quality and the depth of Morrison’s research, and his intelligent assessment of the evidence thus assembled, make this the most comprehensive and reliable account of De Quincey’s life. Morrison is at ease with his subject, appreciating his strengths and achievements, but also acknowledging his weaknesses and failings; avoiding both panegyric and censure to create a sympathetic yet fully nuanced appraisal of this enigmatic personality. Morrison’s own dexterous and engaging authorial style is an additional pleasure throughout a book which honourably fulfills its ambitious purpose. 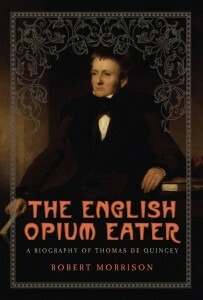 The English Opium-eater should now be regarded as the standard and indispensable biography of Thomas De Quincey.” – Martin Haggerty, The Coleridge Bulletin, Summer 2010. “It’s all vividly and affectingly told in The English Opium Eater: A Biography of Thomas De Quincey, the first new life of the man in about 25 years….Most of all, Morrison is a fine writer of biography, and The English Opium Eater is one you just won’t be able to put down. It may even make you run out and read some De Quincey, which is about the highest praise you can bestow on any literary biography.” – Hans Werner, Toronto Star, 25 June 2010. “Gripping new biography… Morrison’s book offers one of the fullest and most vivid accounts of the bohemian life of the Opium-Eater.” – Gregory Dart, Times Literary Supplement, 9 April 2010. “A thoroughly compelling and eminently readable portrait of De Quincey underscored by serious scholarly work….A 400-page biography of a 19th-century writer and drug addict might seem daunting (especially when one considers the additional 50 pages of scholarly end material), but The English Opium-Eater is nothing of the sort….It is not only scholarly but thought-provoking; thorough, but also scintillating, and a genuine pleasure to read.” – Robert J. Weirsema, Quill and Quire, “Book of Exceptional Merit,” April 2010. 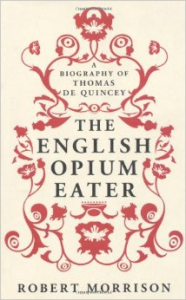 “The English Opium Eater: A Biography of Thomas De Quincey is…so rich in research that the readers can profitably ingest it at a relaxing rate.” – George Fetherling, Toronto Globe and Mail, 27 March 2010. “This isn’t a debunking biography, just a properly sceptical one, and it’s clear that Morrison’s enthusiasm for the man and his writings does not obscure his judgement. De Quincey was one of the strangest geniuses of the Romantic period and that, of course, is saying something…Morrison…makes this maddening, self-deceiving and slippery man so fascinating and ultimately loveable.” – Suzy Feay, The Tablet, 4 March 2010. “The time was ripe for a new biography and Morrison…has done his man proud. This is an exceptionally well-balanced account.” – Jonathan Bate, The Ottawa Citizen, 4 March 2010. “In this well-placed and astute biography, Morrison…traces the sources of De Quincey’s lifelong unhappiness, the seed of his ‘addictive personality.’” – Philip Marchand, The National Post, 13 February 2010. “At his best, De Quincey was an essayist hardly without peer. In this insightful, intelligent and sympathetic biography, Morrison wisely stands back and lets his subject speak, inserting himself now and again to indulge his own considerable talent for story.” – Merilyn Simonds, The Kingston Whig Standard, 6 February 2010. “This biography is well-paced and gripping…an excellent account of an essayist who ‘extended the range and possibilities of English prose.’” – Graeme Voyer, The Winnipeg Free Press, 30 January 2010. “Morrison makes no judgements about his subject’s overwhelming irresponsibility, but tells it all with clarity and dispassion. The English-Opium Eater enhances our understanding of De Quincey’s profligate and cross-grained nature.” – Patricia Craig, The Irish Times, 30 January 2010. “Robert Morrison uses lucid, jargon-free prose to tell this mournful tale with sensitivity and sympathy. He spares us the tedious lit-crit that pads so many literary biographies and resists the temptation to submit his subject’s writings and illnesses to simplistic modern psychoanalytical theories.” – Thomas Wright, Mail on Sunday, 24 January 2010. “Morrison has travelled heroically through a huge corpus of forgotten works and has made the most of unprecedented access to the private papers… Inside the rebel, this eye-opening biography reveals, was an aspirant to the establishment.” – Michael Kerrigan, The Scotsman, 16 January 2010. “A book which is full of insight and careful reasoning….Morrison does a superb job of literary detection going through a life of lies, procrastination and deceit, and teasing out whatever truth there is to be had.” – Jad Adams, The Guardian, 9 January 2010. “Morrison provides a compelling survey of De Quincey’s work as a biographer, satirist, economist, political commentator, translator, linguist and classicist. I cannot think of a more evocative introduction to the life and times of this remarkable writer.” – Duncan Wu, The Independent, “Book of the Week,” 8 January 2010. “As Robert Morrison demonstrates in this engaging new biography, there was more to De Quincey than the addled fanatic who became addicted to laudanum.” – Trevor Royle, Glasgow Sunday Herald, 27 December 2009. “‘Far more than the other great essayists who were his contemporaries, De Quincey speaks to us directly about our divisions, our addictions, our losses, our selves.’ It’s a large claim but one that is borne out by this fine survey of a remarkable life.” – John Sutherland, The Financial Times, 23 December 2009. “The time was ripe for a new biography and Morrison has done his man proud. This is an exceptionally well-balanced account.” – Jonathan Bate, The Sunday Telegraph, “Book of the Week,” 13 December 2009. “Robert Morrison’s biography is impressive, the first biography of De Quincey in almost thirty years, and the first to use all his published and unpublished works.” – Tom Paulin, The Literary Review, December 2009. “Morrison writes…with a combination of perspicacity and generous puzzlement…Thanks to Morrison…the life is clearer than it has ever been.” – James Purdon, The Observer, 6 December 2009. “I knew that I was on to a good thing with this book before the page numbers were even out of roman numerals….This was a lively life, and this is a lively Life.” – Sam Leith, The Spectator, 5 December 2009. “Robert Morrison’s biography is astute and revealing, quarrying new sources.” – John Carey, The Sunday Times, 22 November 2009.